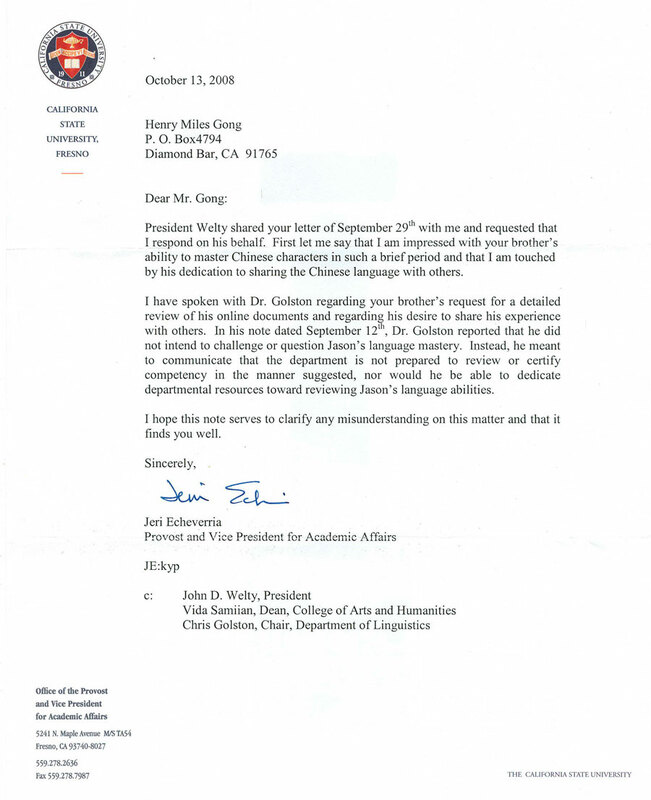 I would like to thank you for your words of compliment in regards to my World Record of learning Chinese written language, especially about my iconic memory, in your September 12, 2008 letter. 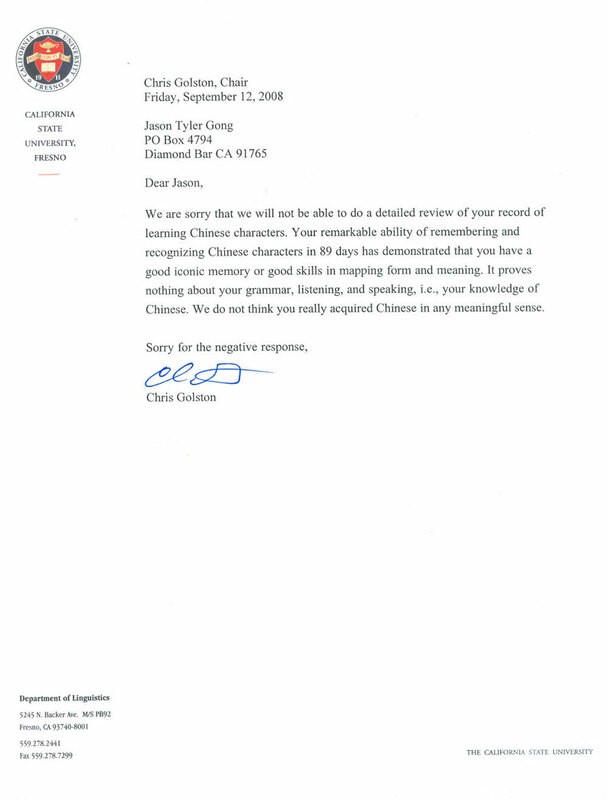 You commented on the use of grammar in the Chinese language. I would like to respond to this briefly. When looking at the terminology of grammar in the English language, we can view it to contain four major parts. There is word order, such as subject, predicate, etc. There is word tails that produces the parts of speech, numbers, etc. There is word tail functions, which controls tenses, mood, voice, etc. There is dangling words or words without a tail that form prepositions, articles, etc.. All English grammar is composed of only with these four parts. Note: In English grammar, preposition is classified as a part of speech. In this new system, it is actually a dangling word. When looking at the terminology of grammar in the Chinese language, it has a completely different meaning. Not a single English grammar element is in the Chinese language; moreover, it does not have any such comparable parts. Chinese characters and vocabularies have no tails, that is, in a grammatical sense; there is no parts of speech, no tense, no mood, no voice, etc. Despite this fact, Chinese written language has no problem expressing such functions. The true Chinese sentence (especially in classic writings) adheres to no word ordering. Although at a low level, such as newspaper articles, common verbal writings, etc., the Chinese sentence has adapted to use an English-like sentence structure, the word order. Twenty years ago, a new mathematics was invented called Fractal. With Fractal, a virtual universe can be constructed. In fact, the real universe was constructed with the Fractal principle, the Self-Similarity Transformation, which is a logic algorithm that replays itself over and over in many different levels. If in your letter, the term grammar means the Fractal principle for the Chinese written language, then our positions are in concert. If it is not, then I would like to share the true meaning for the term grammar in the Chinese language with you. The entire Chinese written language is constructed with the Fractal principle in four levels. Character (word) Form – composed of sub elements (word roots). Character Meaning – self expressed by its sub elements. Word (Vocabulary) System: In English, the meaning of each word and the sentence structure (grammar: tense, mood, voice, parts of speech, etc) give the meaning to a sentence. Without an English-like grammar, the Chinese character is not similar to the English word or vocabulary which is a direct component for providing the meaning of a sentence. Although some Chinese characters can act as English-like vocabulary, the word phrase (composed of at least two Chinese characters) is true Chinese vocabulary which is the bottom unit for providing the meaning of the Chinese written sentence. 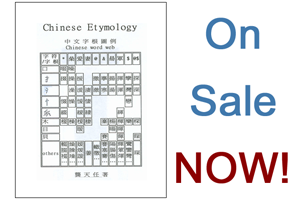 The form and meaning of Chinese word phrase come directly from its composing characters. Thus, it is quite obvious that this is a repeating logic from the previous system, composite and self expression. And, this repeating logic is the Fractal Self-Similarity Transformation. Sentence system: If the meaning of Chinese sentences depends on word ordering, then the above logic (Fractal principle) no longer repeats itself. However, this is a very big issue and can not be discussed in full within this short response. If you are interested on this topic, I will further discuss it with you. I do guarantee to you that the meaning of Chinese sentences (especially in the classic writings) depends not on word ordering, despite the fact that many modern Chinese writings have adapted to carry a kind of word ordering. Note: the character order in a word phrase does change the meaning of a phrase. Essays: Almost for every written language, the meaning of the essay comes directly from its composite sentences and is self expressed. The repeating logic of the Fractal principle is again apparent. A higher lever system is built by repeating the same set of rules. Rule of building blocks: There is a set of rock bottom building blocks (such as, word roots, characters, Vocabulary, sentences, etc.). Rule of composite: A particle (character, word phrase, sentence, essay, etc.) of a system is always composed of sub-particles. Rule of meaning: The meaning of a particle comes from the self-expression (and the combination) of the sub-particles. With this Chinese grammar, the entire Chinese language universe (about 60,000 characters, 10 millions word phrases, etc.) can be handled with 220 word roots and 300 sound modules. That is, every committed American high school student can master the Chinese written language universe in three months of study. This is not an arguable statement but a testable one. Thank you for your kind words about my good iconic memory. Yet, I must confess that I do not have a good iconic memory. By learning this Chinese grammar, I can duplicate (in hand writing) any unknown Chinese character (however complicated it is) after glancing at it for only 3 seconds. I can also decode its original meaning from its face. I am very certain that native Chinese professors in your department teaching the Chinese language cannot reach this level. In fact, I would like to challenge them on this point. There is a mathematics law. Every system has an inherited complexity. By re-organizing a system with a new system, it can never go below its inherited complexity as the growth of the new system will have an increasing complexity of its own. On the contrary, a simple system can be made very complicated, in fact, to infinite complexity. For some historical reasons, Chinese written language was artificially complicated to become one of the most difficult language to learn. There is still 15% of native Chinese people who are illiterate because that no one in China today understands the Chinese grammar mentioned above. Thus, if one is already very versed in Chinese written language, he will have a difficult time to understand my work, as he would have been brain-washed by a fake complexity. If one is not, he can master Chinese written language in 3 weeks (not months if he is already a linguist) by learning the Chinese grammar outlined above. Again, this is not an argument but a simple testable fact. It is testable by you in person or by any committed American high school student. By the way, my World Record was reviewed by the Executive Yuan (Premier’s office) of Taiwan, Ministry of Education of Taiwan and many universities both in Taiwan and China.